I have been an avid reader my entire life and I’m hoping to pass that along to our kiddos as well, so we read a lot in our family. A lot. We have been reading to each of them since they were just days old, and we read to them every single night before bed. As you can probably imagine, we have accumulated a lot of children’s books over the years. We have books about everything – trucks, princesses, colors, feelings, letters, dinosaurs, teddy bears… you name it, we probably have it. In addition to all of the traditional children’s books, we also have tons of different books for each of the holidays – Valentine’s Day, Easter, Halloween, Thanksgiving, and Christmas. Because we have so many, it’s really hard to keep up with all of them, and many of our holiday books were getting lost in the shuffle each year… weeks after Christmas I would find that we had forgotten to read one of our favorite Christmas books simply because we had forgotten that we had it in our collection. Not to mention, all of the books are housed in the kids’ bedrooms, and we spend most of our time downstairs in our living room, so the only time the books were getting read was right before bedtime. Last year I decided to do something about our book conundrum, and I purchased a cute little crate from Marshall’s, spray-painted it white to match our living room décor, and I positioned it in our living room right at the kids’ fingertips where we spend most of our time. 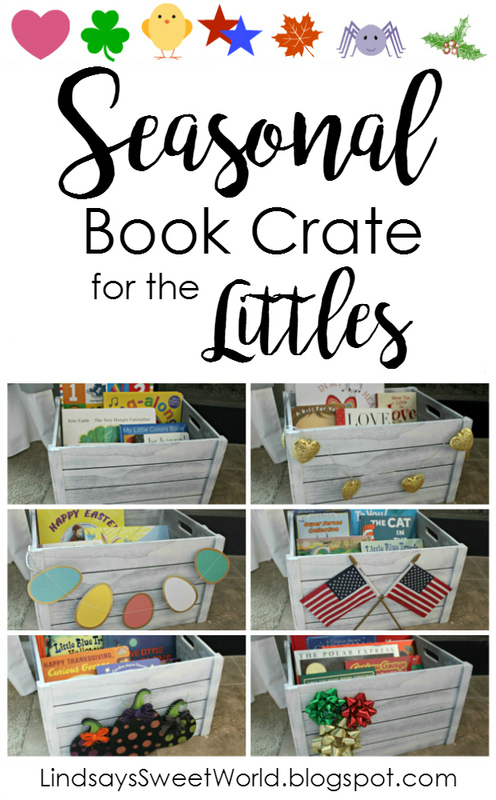 Each season I change out the books (and the decorations on the crate – so fun!) so they have the current holiday appropriate books all in one spot at the appropriate times. 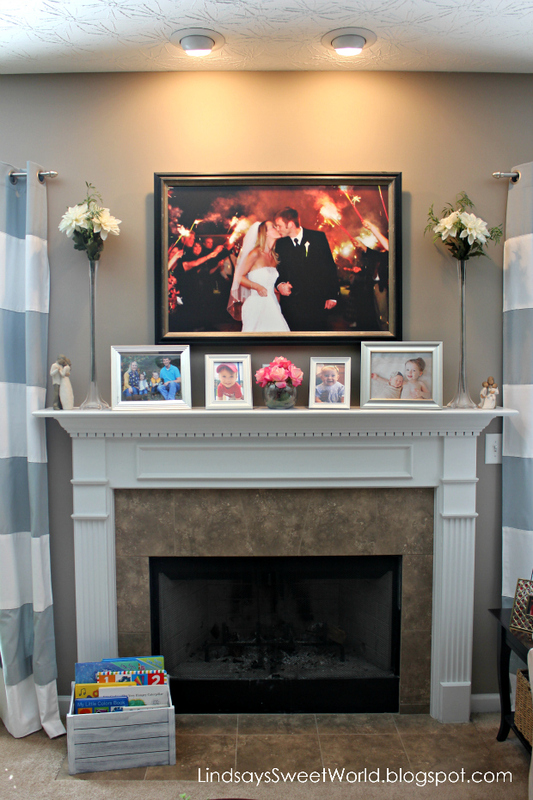 You may remember seeing it in our Valentine's Day Home Tour, our Easter Home Tour, our Fall Home Tour, our Christmas Home Tour, and our Living Room Home Tour. Around mid-January I load it with all of our favorite books about love, so when Valentine’s Day rolls around, we’re all feeling lovey dovey. As soon as Valentine’s Day is over, I put those books up and pull out the Easter books! On September 1st, it’s aaaall about fall! All of our books about Halloween, Thanksgiving, bears going into hibernation, fall leaves, etc. come out and get thrown into the crate. Then the day after Thanksgiving, all of the Christmas books come out. These are my personal favorite (and the kids’ as well) and the Christmas genre is by far our biggest collection. During the off months with no major holidays, I fill the crate with random miscellaneous books, and rotate them out often so the kids are reading different stuff. That way all of their books get read at some point, and we don’t have any just laying around collecting dust. This past weekend I pulled out all of the fall books, and friends, let me tell you that I could not be more ecstatic! This book crate has become such a source of excitement for preparing for our favorite holidays and I’m going to enjoy it while I can… I know our years for this particular tradition are numbered as one day our littles will no longer be interested in reading The Night Before Christmas and Happy Easter, Mouse. I guess at that point, we will just have to figure out a new use for the crate! *Linking up with Our Pretty Little Girls for Tuesday Talk and Simply Every. I always have books pulled and put out in our living room as well. We are huge readers in our house, but have the same issue as you that most books are upstairs in their rooms. I love swapping books out to read and getting out or holiday books. I need a crate though and love your idea of one. This is such a cute idea! And it really adds to the festive decor of the season! I love this! We do the same thing. I love seasonal books and find if they are just mixed in their bookshelf they don't get read as much. Love your festive touches to the basket depending on the holiday! Love how you change the decorations on the crate! So clever. That's great that you have the books so accessible for them! I love that you decorate the crate for each season/holiday! Such a fun touch! I've been wanting to incorporate something like this, maybe this is the year! Love how you also decorate the actual bin- nicely done! This idea is amazing all by itself and then you decorated the crate and I swooned. I LOVE this so very much. It is so smart and adorable. I love this! I'm going to Hobby Lobby to pick up a crate ASAP! You're welcome! I can't wait to see yours! I love this idea! I am in grad school getting my masters in library science, and I am currently taking a children's lit class. We are learning that the best way to encourage little ones to read is to have books readily available in the home. This is such a great idea for having books available in a fun way! Well I guess it looks like we're doing the right thing, then! Thank you for your sweet comments, and thanks for stopping by! You and your fantastic ideas never cease to amaze me!!! All our books are jumbled together too. Austin loves Cmas books so much it will be mid-summer and he wants "Twas the Night Before Christmas" as his bedtime book. I love this idea to get lesser read books some time in the spotlight though! So fun that you switch it out seasonally and with the holidays - that is such a great idea! I love this! I remember when my mom would get out all our Christmas books - it was such a treat. Having a little container with seasonal books AND decorating the crate is such a great idea! We have a book basket in our living room that I switch the books out for seasons, too, but I LOVE the idea of a crate! I love how you decorate it for each season, too! Precious! I bet your kids look forward to it each season. This is such a great idea and I love the little decorations on the front! Awww... I LOVE it!!! I'm totally stealing the idea! This is such a good idea. I don't have any kids but plenty of nieces and nephews and will be sharing it with their mothers. Thanks, Rose! I hope they like the idea! What a fun way to showcase books that match the season! I love the idea! Using books as seasonal decorations is one of my favorite things to do! Your crate idea is darling. I LOVE this idea so much! My son's bookshelf is filled to the brim and hard to organize because the books are so slim. We have tons of holiday books so this idea is perfect. I hope it works out well for you guys then! Happy weekend! What an adorable little crate! I love this idea! Such a great idea! We have a bin in our living room and i will definitely be putting fall books in it now! Yay, I'm so glad that you like the idea! Happy reading! Great idea! I do something similar with Mila's books - I always display her seasonal books on the wall shelves in her room. We have a ton of books so I may need to do something like this crate as well! I love how you decorate the crate itself also!